The IoT data intake is limited in many ways by depth and extend. This is necessarily so, because connected devices only ever work within a limited scope; technologically as well as business. can only provide a limited data analytical output, because we are missing a lot of business and commerce context. cannot address the regulatory requirements demanded by say GDPR or HIPAA for medical devices. This must be done in the place where we have a holistic view. 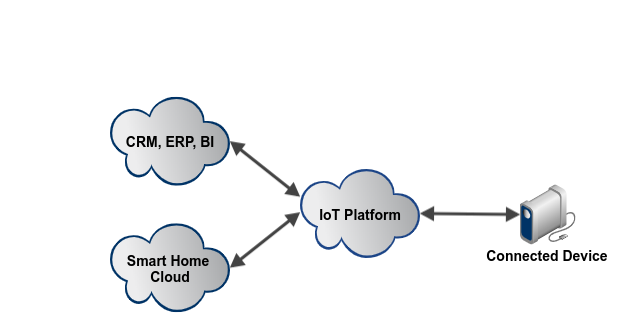 The current approach to smart products often focuses on connecting and managing an appliance, and typically involves your product division as the main stakeholders. But as the smart consumer products market evolves, it is not just the Product Division that benefits from connecting the products to the IoT. Your Sales team can be notified when your product is approaching the end of its life cycle and needs renewing. Marketing can deliver targeted offers based on which products your customer is using. 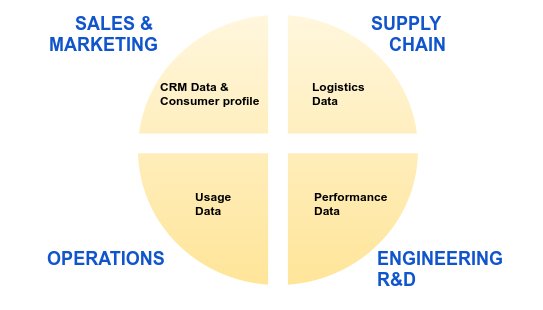 Engineering can glean valuable data from the field about product usage or the performance of individual components. Service can see what is going wrong with a product and integrate with business systems such as SAP, or salesforce.com’s Service Cloud. Supply Chain can capture data about how products are transported and delivered. This rich data delivers valuable new customer insights, cost efficiencies and revenue growth opportunities for your business. To capitalize on these opportunities, you must design your IoT platform that allows you to configure granular data access policies. Having a true enterprise account structure combined with a flexible access control API will allow you to set permissions for people, teams, departments or even external companies on which segments of data they can access, and what level of changes (read/write/delete, etc.) they can make. This way your business units can collaborate effectively and control the different solutions derived from your smart products line. Take the Consumer Electronics and Appliance manufacturers for example. It is hard to know which proprietary connected home ecosystem they should align their smart products with. There are already a number of popular smart home IoT clouds in the market, such as Homekit, Nest, SmartThings and Wink, and an increasing number of smaller clouds from retailers and device manufacturers are emerging. It is likely that from a pure market share perspective, you will want to capture the largest possible slice of the pie, which means making your product compatible with many or all of these. But which of the current dominant players will rise to the top? Will product innovations spring up to disrupt and derail them? Therefore, rather than picking an ecosystem to gamble on, you need to design or choose an IoT platform that can easily integrate with all third party, proprietary clouds — now and in the future. This also takes integration complexity and heavy lifting away from your Product team, letting them focus on product innovations that win more customers and garner market-share instead.